Making South American style cooking sauces and selling in 738 outlets. You can fund their new products here. Paid back on 25 Jul 18 5 days early!!! Capsicana was founded 9 years ago by Ben Jackson. Today their sauces are sold in 738 stores across the UK including Sainsbury's, Waitrose and Whole Foods. This year Capsicana is launching several new product lines and would like you to fund their launch. Capsicana's offer is fully backed by stock of their best-selling products. In return for your support Ben is offering PrimeStox investors repayment with a profit of 7.1%, paid in just 5 months. You'll also become a Friend of the brand. 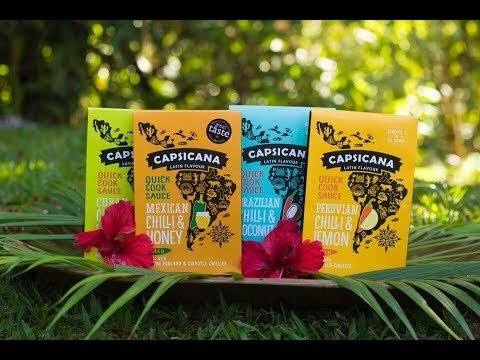 Capsicana successfully raised £42,000 to fund the production of 42,000 packs 431 days ago. Check back soon for more offers. The idea for the name Capsicana came to Founder Ben Jackson at 2am one night as he was working. He thought of combining the word Capsicum - a name for South American chillies - and Mexicana. So was born Capsicana! Now almost a decade later, Ben is proud to be selling Capsicana cooking sauces in 738 shops across the United Kingdom. 2017 saw the company take a great leap forward. They gained high profile advisors, brought in large investors and launched in Sainsbury's. The company remains true to its roots however. It is still driven by Ben and his desire to popularise the superb Peruvian, Brazilian and other South American sauces he tasted with his father in his childhood. The company's mission is to bring these Latin flavours to Britain and the world. Today Capsicana is achieving sales of £25-35k per month: over £300k per year. Expected total sales this year are £900k. Several new products are ready to hit the market in the first half of 2018. Founder Ben Jackson would like you to fund their launch. This will cost £42k and the funds raised will pay for packaging, raw materials and bulk purchases from suppliers. Capsicana's offer is fully backed by over 17 pallets of their four product lines, stored in Capsicana's distribution center in Wakefield. In return, Founder Ben Jackson is offering you a profit of 7.1%, paid in just 5 months. You'll also become a Friend of the brand and receive updates about the exciting new products you funded when they reach supermarket shelves.